On his first day in basic training in 1942, Lawrence Cane wrote his wife Grace from Fort Dix, New Jersey. "I'm in the army now?really!" he wrote, complaining, "I don't have enough time to write a decent letter." Three years later, Capt. Lawrence Cane went home from World War II. He'd landed at Utah Beach on D-Day, helped liberate France and Belgium, and survived the Battle of the Bulge. He won a Silver Star for bravery. And he still managed to write 300 letters home to Grace. This book is a different kind of war story--both an powerful chronicle of life in battle and a unique portrait of courage fueled by a life-long passion for political justice. Cane's fight for freedom began well before D-Day. 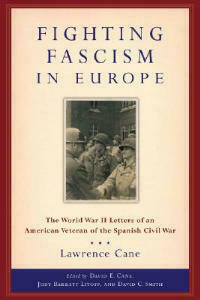 In 1937, joined the Abraham Lincoln Battalion and got wounded fighting for democracy in Spain. In 1942, at age 30, he enlisted in the new war against fascism, and as an officer with the 238th Combat Engineer Battalion, went ashore in Normandy to clear mines, destroy fortifications, and open roads from Normandy to the Siegfried Line. Of the 400 Spanish Civil War veterans in World War II, Cane was the only one to go ashore on D-Day. After the war, Lawrence Cane fought for civil rights and peace until his death in 1976. Discovered in 1995 by Cane's son David, his letters are not only classic accounts of war and unforgettable expressions of love for family. They are the fiercely patriotic words of a left-wing, working-class New York Jew (and one-time Communist Party member) who knew exactly why we fought---to create a better world by destroying all forms of fascism, one battle at a time. With a fascinating introduction by David Cane, detailed notes, and much additional material, these letters add a new dimension to the meaning of American patriotism and an invaluable chapter to the history of "the greatest generation."